Palestinian official calls pope's words, "a huge step in the right direction"
BETHLEHEM, West Bank (CNN) -- Pope Benedict XVI called on Israelis and Palestinian to put aside their "grievances and divisions" and work toward reconciliation in the Middle East during a speech in the West Bank. 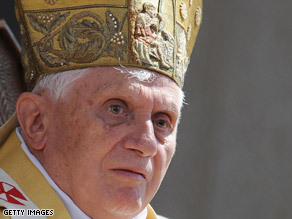 Pope Benedict XVI called for Israelis and Palestinians to keep the "flame of hope" alive for peace. "Just and peaceful coexistence among the peoples of the Middle East can only be achieved through a spirit of cooperation and mutual respect, in which the rights and dignity of all are acknowledged and upheld," the pontiff said Wednesday at a speech attended by Palestinian Authority President Mahmoud Abbas in Bethlehem. "Mr. President, the Holy See supports the right of your people to a sovereign Palestinian homeland in the land of your forefathers, secure and at peace with its neighbors, within internationally recognized borders," Benedict said. "Even if, at present, that goal seems far from being realized, I urge you and all your people to keep alive the flame of hope, hope that a way can be found of meeting the legitimate aspirations of both Israelis and Palestinians for peace and stability." Although the pontiff was speaking in the West Bank, his words were likely intended also for Palestinians in Gaza, where they are rebuilding from a month-long Israeli offensive that began in December. Palestinian officials eagerly welcomed the pope's words. "I think this is a very, very powerful message," said Saeb Erakat, the Palestinians' chief negotiator. "I hope this would reach the ears of all Palestinians, so people today will not feel alone, will not feel abandoned, will not feel scared, will not feel hopeless. "I am not saying that the pope will turn the train tomorrow and change things, but this is a step, a huge step in the right direction," Erakat said. The pope later celebrated Mass in Manger Square and visited the Grotto of the Nativity, believed to be the birthplace of Jesus. The pontiff was also scheduled to tour a children's hospital and a Palestinian refugee camp.